Dog lovers know that picking a breed is often an important part of responsible pet ownership. It also says a lot about ourselves and can be a source of self-awareness. Choosing a pet that is a good fit is important for the family as well as for the dog. Too often, a wrong match can lead to the pet being mislabeled as a “bad dog” or not having the life that they deserve. People have often scoffed when I have said that dogs are an important part of my spirituality. I am a dog lover. I enjoy their companionship and have fun playing with dogs, but it is more than that for me. My first dog was a Siberian Husky, and my current dog is an Alaskan Malamute. These are beautiful dogs. When watching them run or pull, looking into their eyes, or being out in nature with them, I am so often amazed that these beautiful creatures have such strong human connections. My relationship with my dogs has helped me stay connected to nature and to the earth. They remind me that we are connected with something more than ourselves and more than our species. To love and be loved in this way is powerful. 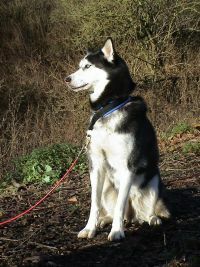 I had been drawn to the northern breeds, particularly Siberian Huskies, since I was a child. However, I did not get my first dog, Amaya, until I was in graduate school. We had a very deep bond, one that some of my friends and family found strange and were even critical of at times. I learned a lot from Amaya, which I began to recognize increasingly as I used her more and more to illustrate aspects of psychotherapy. She was, in ways, a therapist and even mentor to me. She was with me through many difficult transitions in my life, including several major moves, the ending of a long-term relationship, and the loss of some people very close to me. She also was a muse, of sorts, as she served as inspiration for some lectures, professional writing, and poetry. Over time, I began to reflect upon what drew me to the breed of Siberian Huskies. As I did, I realized that huskies tended to share many qualities of my own temperament and personality. Also, I think they represent qualities common in existential psychology. First, Siberian Huskies are known for being pack animals, but they are also quite independent and stubborn. In this way, they provide a balance to the being a-part-of and apart-from that Bugental (1999) speaks to. Although existential psychology is often misperceived as being highly individualistic, this is not necessarily so. While some existentialists represent a more extreme individualist perspective, there tends to be a strong relational focus that balances the individualist tendency. Amaya was a very stubborn dog. She quickly learned many commands, but she decided when she wanted to respond to them and when she would ignore them. But she was also a great companion and fiercely loyal. When I was going through a difficult period she always stayed close. Amaya was also protective, as a skunk who had the misfortunate showing an aggressive posture toward me discovered. That was not a pleasant lesson for any of us. Huskies are considered a “working breed.” As someone who has often struggled with workaholic tendencies, this seemed fitting. Though Amaya was never trained to pull a sled or the roles often thought of with the working breed, some of the traits associated with this often showed in her perseverance. Last, huskies are also known to be fairly intelligent and creative. In particular, they are known to be great escape artists and can be difficult to contain. Although Amaya did show that she could use these skills to get out on a few occasions, she used them more frequently to learn how to get inside as she learned to open a variety of doors over the years. Creativity, too, is a common theme in existential psychology. While some of these qualities were frustrating at times, I also knew that they were a part of my deep love for Amaya. I did not want a dog that was completely compliant, nor did I want a dog that was aloof. Amaya had a personality and I wouldn’t have wanted to change this. This, too, I see as being very existential. While some approaches to psychology focus on trying to change people to better fit in, the existential approach tends to help people find out who they are and want to be. There were ways that Amaya conformed to my desires, but she was always herself, too. When people speak of dogs and pets in such ways, it is common to hear some scoff that this is nothing more than projection. I suppose this is a possibility and I’m sure there are times when this is true. Yet, I think there is much we can learn and discover if we are open to learning from our pets. We can learn from their way of being, but we can also learn from our relationship with them and why we are drawn to loving them the way we do. Bugental, J. F. T. (1999). Psychotherapy isn’t what you think: Brining psychotherapy engagement into the present moment. Phoenix, AZ: Zieg, Tucker, & Theisen.